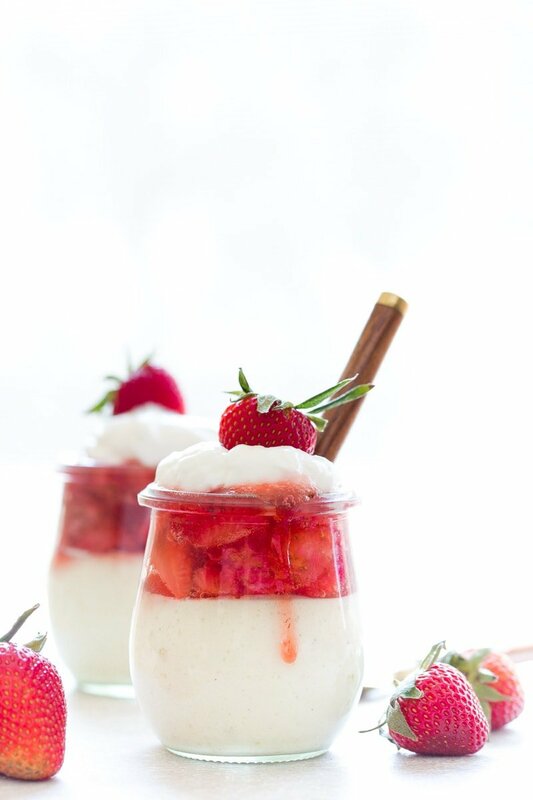 Greek yogurt cheesecake for two, in mini jars! This lighter version of cheesecake is so easy to make, plus the fresh strawberry sauce sweetened with honey is scrumptious! I have to confess: when Greek yogurt first became a thing, I over-dosed on it. At any given moment, you could find my fridge filled with every color and flavor of Chobani. I may have even had an entire shelf in my fridge devoted to it. It was a glorious, creamy time in my life. But, like most good things, it had to end some day. These days, I can hardly look at yogurt. I’m just bored with it, ya know? I drink plain kefir with a dash of maple syrup at breakfast a few times a week. It’s been a long time since I’ve bought a little cup of yogurt. On the other hand, cheesecake and I are on good terms. Oh, cheesecake and me are long-time best friends; we’ve never even had one fight–not even during bikini season! This is because I like light and airy cheesecake that has a mousse-like consistency. The best way to get a light, fluffy cheesecake is to actually not use cream cheese. Crazy, right? My love of cheesecake is a known fact around this site: no bake cheesecake for two, cheesecake in a loaf pan, and mini cheesecake muffins. I just think that cheesecake is such a special addition to any meal, and it’s always welcome on the dessert table. When I serve Greek yogurt cheesecake, I notice that my guests always are so shocked. I think most people think that cheesecake is difficult and finicky to make, and so it’s perceived as something special. I’m all too happy to keep this little secret to myself. This greek yogurt cheesecake for two is so simple! These little pots of cheesecake are made with just 2% plain Greek yogurt, an egg, a touch of sugar, vanilla bean paste (you can sub regular vanilla), and a little cornstarch. I bake the little pots in a water bath, because I want to ensure they’re the fluffiest they can be. I have a feeling this question will be asked in the comment section, so I’ll address is now: you should really use plain, Greek yogurt. The reason I don’t use vanilla yogurt even though it’s a vanilla cheesecake is because the amount of sugar varies in each brand, and I want the results to be consistent. I’m a big fan of fresh fruit on top of cheesecake. Cheesecake can be a rich, strong flavor, and the light acidity of fruit is such a great counter blanace. Think of it as a palate cleanser that lets you keep going back for more bites of dessert! When my greek yogurt cheesecake comes out of the oven, I slide my sliced fresh strawberries into a small saucepan with just a touch of water. The heat will start to break down the strawberries, which intensifies the flavor. So even though we’re starting with 2 cups of fresh strawberries, the end result is roughly 3/4 cup of condensed strawberry flavor. In an effort to make this recipe lighter, I don’t add any sugar to the strawberries while they cook. Instead, when they come off the heat, I stir in honey to taste. I don’t add honey to the pan while the berries cook because I don’t want the heat to destroy the delicate flavors of the honey. I always reach for a floral, orange blossom honey–it compliments fresh fruit so well! Garnish with more plain yogurt, and the prettiest strawberry in the batch. Can you double this recipe for lighter cheesecake? Yes, absolutely! The fun thing about this recipe is that you can double it because it’s a simple ratio of ingredients! One more time for the people in the back: you can double this recipe to your heart’s content! The ratio is one egg per two servings of cheesecake. So, feel free to scale up this recipe to your heart’s content! Make 50 pots of cheesecake if you want, and then come to my house and share, please? Side note: we actually did this for the San Francisco stop of my book tour in 2017! Though we serve smaller portions when we’re sampling recipes, but I wanted you to know that a caterer successfully scales this recipe up to serve a crowd. So, let’s eat cheesecake fearlessly even though bikini season is just around the corner! Who’s with me? 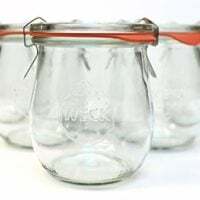 These are the cute mini Weck jars that I’m using in the photos. 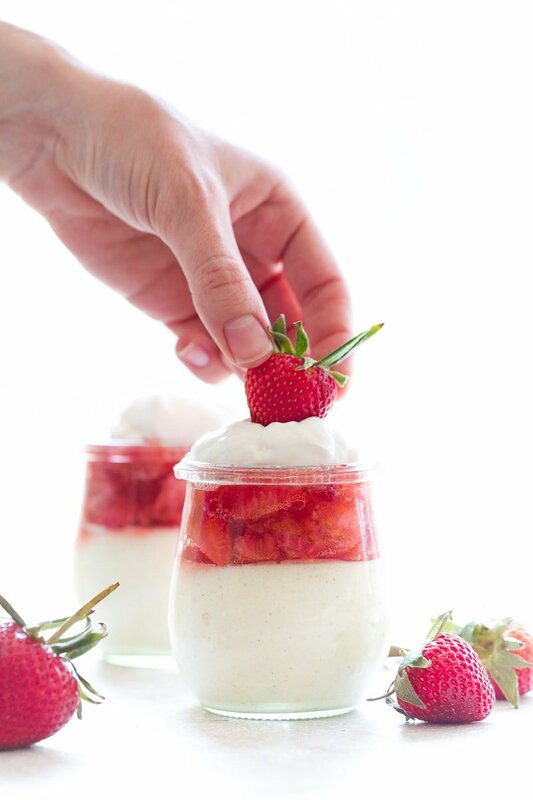 Greek yogurt cheesecake for two, in mini jars! Preheat the oven to 375, and fit two mini 1-cup jars into a baking dish. Fill the baking dish with water so the water comes up the sides of the jars about 1". Set aside. In a mini food processor, combine the yogurt, sugar, egg, vanilla and cornstarch. Pulse until well-blended. Divide the mixture between the jars, and bake for 23-26 minutes--the tops will appear set and may even start to very lightly brown. Cover the jars and chill in the fridge for at least 4 hours. 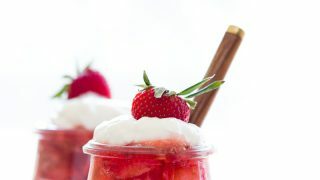 Meanwhile, make the strawberry topping: in a small saucepan, combine the sliced strawberries with a splash of water. Cook over medium heat until they collapse and the sauce starts to thicken, about 5 minutes. Remove from heat, and stir in honey to taste. Let the strawberry sauce cool, and then divide it evenly on top of the cheesecake jars. Garnish with extra yogurt, and more fresh strawberries. This is such a fun way to eat cheesecake! Love the sound of this friend! My husband would eat cheesecake for every single meal! I’ve got to make this since it is nice and light! These are just adorable and sound so good! i love cheesecake but it has to be slightly sour and fluffy! this sounds so good and im very interested in this yogurt version. I’M WITH YOU, body and soul! Can this be made in regular cooking pans??? I didn’t try it that way; I only tested the recipe the way it is written here. But, if you try it that way, we’d all love to hear how it works! This looks perfect. I would love to have this a dessert! Christina, these look so amazing. I can imagine endless flavor possibilities too! Maybe even a bit of rhubarb in that compote! Gosh, this sounds great. And so simple. Yet, why the specialized mini cups and mini-processor? What about the less kitted out among us? Maybe a blender? Maybe little pyrex cups. ??? 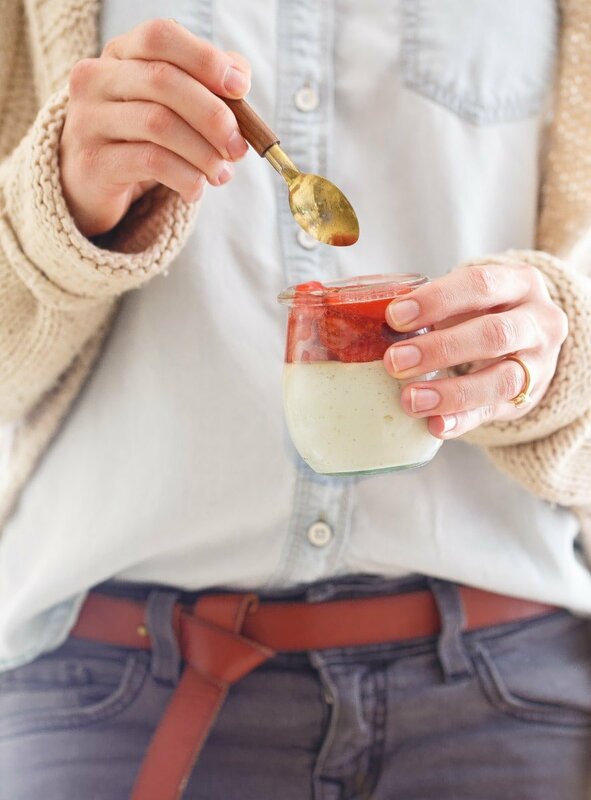 Totally use a blender and any small baking jars you have…these little jars are actually just fancy mason jars, so any equivalent size will work. These sound amazing!!! And beautiful, too!! I burned out on yogurt too for a period of time but my daughter loves it so I have been eating more lately. Thank you for taking away the urge to make a chocolate cake that would scream at me to eat more until I finally finished it. Thursday I get my cheat meal and can have whatever I want, so I’m going to eat cheesecake — instead of that awful chocolate cake. You are an angel, and this cheesecake is really good! I don’t have granulated sugar. Can I use honey or maple syrup instead?? Have you tried making these in the IP mini? I have made regular cheesecake in mine and it was delicious, so I was just curious if you’ve tried these in there. Come summer you and I will be baling in the heat and the IP is much better than turning on the oven.